Petroleum system starts with the deposition to storage from where the production is obtained. Petroleum system journey starts with the deposition of organic matter. The deposition of organic matter starts when organism starts to die and deposits deep down the ocean floor and the above deposition of clay (finer grains). The clay particles are about 1/256 mm size and is called shale. Organic matter deposited on the ocean floor cannot be oxidized due to the depth factor so they can produce hydrocarbon. Hydrocarbon generation needs the cooking of organic matter at high temperature and pressure and it is obtained when it goes into overburden of deposition by clay particles and greater depths. In the petroleum system the source rock are the shale (clay that goes under high pressure and temperature which cooks the organic matter). Sometimes limestone can also be the source rock with 1% of organic matter contains. So theses rocks undergo cooking where the temperature and pressure determines what type of fuel will be generated. Despite of temperature and pressure another factor in producing hydrocarbon is the time span required to generate fuel. The time is a critical factor as if the organic matter is cooked for less time it will not generate hydrocarbon and when it is greater than the oil produce will be converted into gas. Reservoir as indicated by the name reserves of hydrocarbon. the hydrocarbon cannot be obtained from the source rock because of the higher pores but are lesser to none interconnection. For the extraction the pores should be interconnected so that it can travel when are extracted. But if there is no reservoir and obtaining fuel from source rock it must be fractured for permeability generation. Reservoir rock are mostly sandstone which have higher porosity and permeability but in some cases limestone also serves as reservoir rock. Limestone all by self is not a good reservoir due to fine particles present which give less permeability but as limestone is calcium carbonate so it can be dissolved in water which are the Karst topography. Only then can limestone have permeability required for hydrocarbon to be obtained. Migration itself is cleared so the primary migration occurs when hydrocarbon moves from source rock to the reservoir rocks. 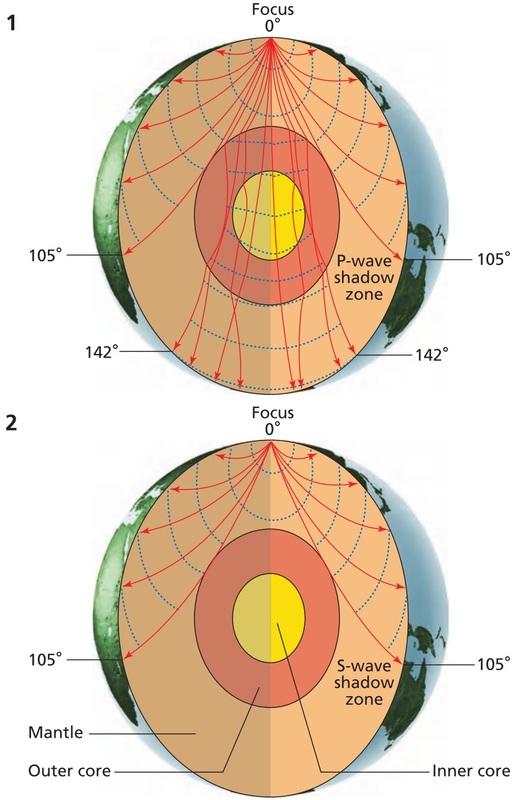 Primary migration occurs when the source rock is fractured due to tectonic forces (plate movements) or by the overburden squeezing the source rock. As HC (hydrocarbon) have low density they moves upward. 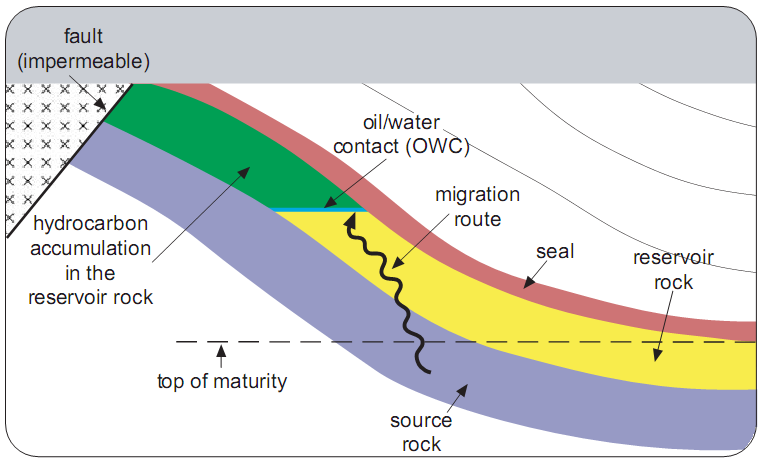 Secondary migration is the HC movement within the reservoir rocks. The HC will moves upward in the reservoir rocks. Trap or seal rocks are those that are present above reservoir rocks as HC movement will always be upward. Seal rock are those that have low to none permeability so that HC cannot escape but are trapped within the reservoir rocks. Shale can be seal rock also as they have porosity but do not have permeability factor so HC will be trapped. Types of traps include stratigraphic and structural. Stratigraphic traps example is shale as a seal rock and structural traps are fold or faults. The last thing in the petroleum system is time as have said it above already, time is required for HC generation which is always critical. No more time and no less time while cooking of the organic matter or it will not produce the fuel. Online geology degree and courses are offered at multiple forums. Geology is study of the rocks, minerals, and the forces that shape the earth, like water, wind and earthquakes. Learn about the levels of geology degrees online you can pursue partly or fully online, common courses and career options in the field. Schools offering Environmental Science degrees can also be found in these popular choices. A geology degree is widely valued by employers when looking for employment as a geoscientist, hydrogeologist, or an environmental attorney. Geology majors also go on to work as a sedimentologist, a geophysicist, and many other important careers that help our environment. The schools we list on our site are accredited degree programs in geology and related fields at the associate and bachelor’s degree levels. Geology is a science that studies the Earth and the materials that it’s made of. It looks at the rocks that the Earth is composed of, the structure of the earth’s materials, and the processes acting upon those materials that cause the Earth to evolve. Through the study of geology we can understand the history of the Earth. Geologists decipher evidence for plate tectonics, the evolutionary history of life, and the past climates the Earth has been through. Geology also includes the study of organisms that have inhabited the planet, and how they’ve changed over time. Currently we use geology for mineral and hydrocarbon exploration, evaluating water resources, predicting natural hazards, finding remedies for environmental problems, providing insights into past climate change, and geotechnical engineering. Through geology degrees people can study geology, become a geologist, and use their knowledge to improve our Earth. 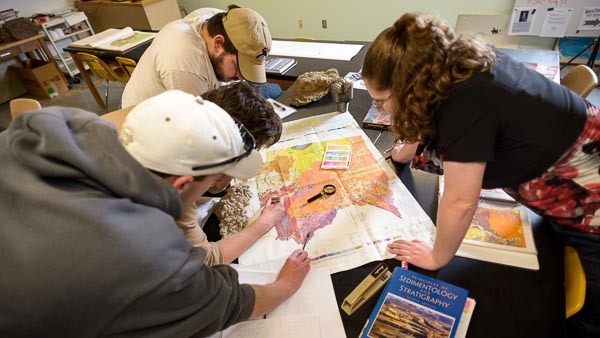 Bachelor of Arts in Geology: The BA in geology degree is intended for students who plan to pursue teacher certification, natural resource management, scientific or technical writing, and other fields that combine a strong liberal arts background with science training. BA classes may include earth materials, minerals, igneous and metamorphic rocks, oceanography, principles of astronomy, deformation of the Earth, sedimentary processes, earth surface processes, and field methods. Bachelor of Science in Geology: The BS in geology degree differs from the BA in that it has a strong mathematical component. It’s typically designed for students planning to pursue graduate study in geology, or work as a professional geologist. Courses may include: History of the Earth, Earth materials, deformation of the Earth, sedimentary processes, Earth surface processes, field methods, chemistry, physics, physics in electricity and magnetism, and calculus classes. Master of Science in Geology: This is a graduate degree in geology. Master programs are advanced geology degrees with a focus on geology classes. They typically come in both thesis and non-thesis options. Those who want to get a master’s in geology degree must have an undergraduate degree in geology or a closely related science field. Sometimes they’ll let applicants without a bachelor’s degree in geology to take pre-requisite classes before beginning a master’s program. Pre-requisite classes include: physical geology, mineralogy, paleobiology, petrography, geologic field methods, stratigraphy, igneous/metamorphic petrogenesis, structural geology, sedimentary petrogenesis, and introduction to geophysics. Doctorate in Geology: A PhD is the highest level of degree a person can get in geology. These programs are designed to develop creative scholarship and to prepare the student for a professional career in the geological sciences. Typically a person chooses a specialization or focus such as geochemistry, geology, geophysics, planetary geology, minerals, or more. Students can be admitted into PhD programs with either a bachelor’s or master’s degree in geology. Depending on the previous degree earned, a PhD may take one to two years of study. What Geology online Degrees Are Available? You can pursue a Bachelor of Arts, Bachelor of Science, Master of Science in geology and Ph.D. in geology. People who earn a B.S. in Geology usually pursue advanced degrees. However, in a Master of Science program in geology, your classmates may have a B.S. in Geology or an undergraduate degree in a related field like engineering or physics. The online geology degree or online geoscience degree can be obtain in B.S. While some schools offer some geology courses online, entire undergraduate degree programs online are extremely rare. Many science lab courses can't be completed online, and fieldwork requires in-person attendance. However, it is possible to earn a Bachelor of Arts, Bachelor of Science, or Master of Science in Geology entirely online with taking online geology courses. How Do I Complete My Degree Online? In an online degree geology program, classes start and end at the same calendar time as the on-campus courses. You do not have to be logged in to the class at a specific time, and instead may view the lectures at your convenience. However, during the course, you may be given assignments that have specific due dates. All of your assignments must be completed by the last day of class. You may have up to eight years to complete your degree. Students attending part-time take 3-4 years to complete their geology master's degree online. If you choose to attend full-time, you may be able to complete your geology online degree faster. You will need access to specific software, usually available for purchase through the school. In a bachelor's online degree in geology program, you learn how certain rocks and minerals are formed and how to classify them. You study the forces that shape Earth's surface, such as weather and plate tectonics, the movement of the Earth's crust. You may also take classes about soil, hydrology or palaeontology. You can also expect to take classes in math, computers, chemistry and physics. You will likely have to complete a field course, in which you may spend an entire semester or a summer in the field, practising your skills on a real-world geology project. Some schools offer field courses on-campus, while others offer them only at off-campus sites. Master's degree students concentrate coursework and thesis projects on a particular area of interest, like earthquake prediction or environmental geology. Ph.D. students take their interest to the next level by completing a dissertation that contributes original research to their chosen area of geology. What Kinds of Careers Will Be Open to Me? While you will be qualified for entry-level employment with only a geology bachelor's degree, many graduates choose to pursue either an advanced geology degree or a professional degree for a career that joins the two interests. For example, you could pursue your law degree and work in environmental law. Geology graduates can find employment as an oceanographer, geochemist or mineralogist, doing direct science research. You could work for the U.S. Geological Survey, or advise state and local agencies on infrastructure planning and policy. Some graduates with advanced degrees also pursue teaching careers. What universities offer online degrees?